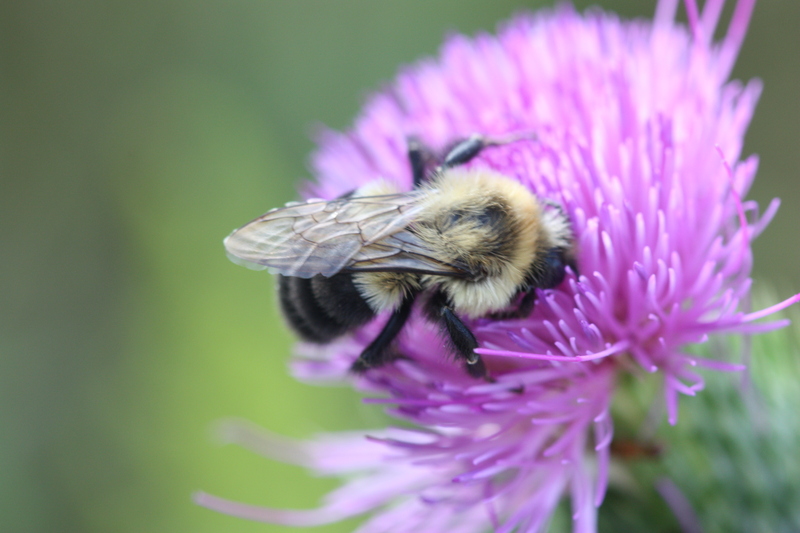 The Common Eastern bumble bee is a frequent flower visitor, spotted by many garden observers. It is distinctive as the only bumble bee with a single yellow stripe at the top of its abdomen (the rest of the abdomen is completely black). While the common eastern bumble bee has always been quite common, in recent decades it has expanded its range eastward into Nova Scotia in Canada and increased in abundance within its original range throughout the eastern USA and Canada. There are many natural history characteristics that make this bee successful in today’s changing landscapes. Firstly, it has adopted man-made objects as good nesting material. In urban areas, its colonies can frequently be found under decks, between cinder blocks, and sometimes even on apartment balconies! Common eastern bumble bees have a medium tongue length, meaning they can forage from hundreds of plant species, including native, introduced and crop plants. Queens can also produce very large colonies of variable size workers, depending on the quality of available food. It is one of the earliest to emerge and continues its colony right into the fall (November in some parts of the USA!). The adaptability of this species to be successful in a variety of conditions has made it the perfect species for managed pollination of many food crops, in fields and in greenhouses. It is an especially good pollinator for tomatoes and sweet peppers, which require buzz pollination (honey bees are incapable of this behavior). An unfortunate consequence of the domestication of this species for crop pollination may be that the Common eastern bumble bee becomes common in the west. Numerous commercial rearing companies are shipping this species all over North America for pollination of a variety of crops and in recent years, it has been spotted in the wild in British Columbia. Although this species is native to Canada and the USA, it poses a threat to the diverse bumble bee fauna of western Canada. Its success throughout its native range indicates it could prove to be quite the competitor for food and nest sites, potentially impacting other native bumble bee species. You can learn more about this species on its profile page.